1. Prepare the grains. Cook chickpeas and tepary beans together in a large stock pot, simmer for 60-70 minutes or until beans are soft. In a separate pot, bring 2 cups of water to a boil, add the cracked farro and simmer for 15 minutes. Turn off the heat and cover. It should be the consistency of oatmeal, it will act as the glue to hold the burgers all together. 2. Coarsely chop the red onion, sun dried tomatoes and mint. 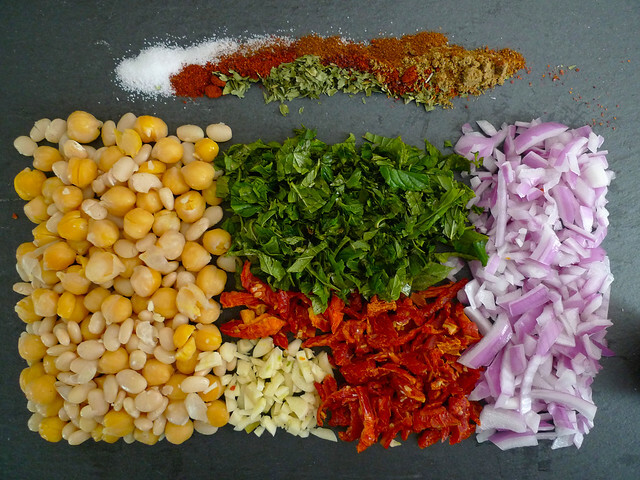 In a food processor combine the chickpeas, tepary beans, chopped vegetables and spices. Pulse until everything is chopped into tiny pieces but not smooth (think tabouleh, not hummus). In a separate large bowl combine the cracked farro and eggs. Add in the vegetable-bean mixture and thoroughly incorporate. This is where is works best to use your hands to really fuse everything together. When it's all mixed, it should form into 3 inch x 1 inch patties easily. 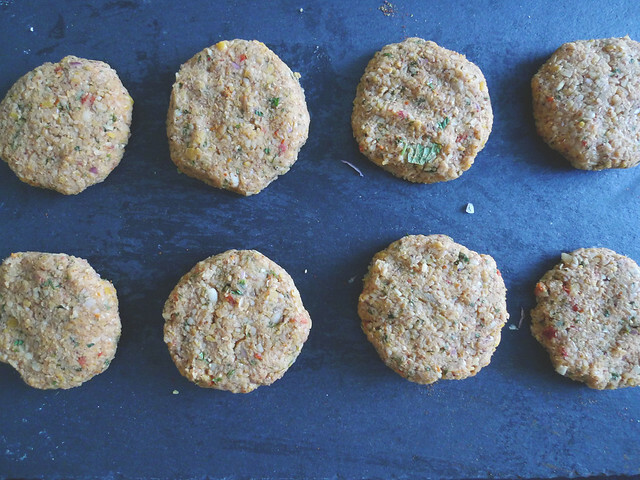 Set the formed patties on a cooking tray and place in the refrigerator for 30 minutes. This will allow them to set and stay together better when they are cooked. 4. Dressing. With an immersion blender, blend avocado, tahini, squeezed lemon and garlic. 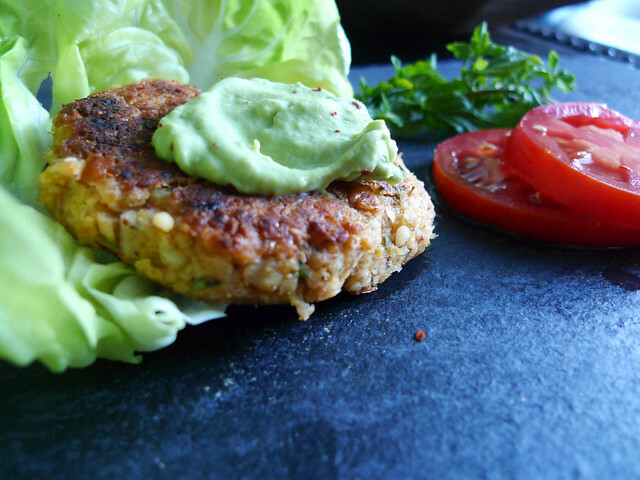 Top the warm veggie burgers with a dollop of this dressing and serve. Optional: thin slices of swiss cheese, lettuce, sliced tomatoes and toasted whole grain buns. Posted on October 22, 2013 by Emma Zimmerman and filed under Dinner, Recipe and tagged Farro Berries 2013.